It’s really easy with our step-by-step guide. 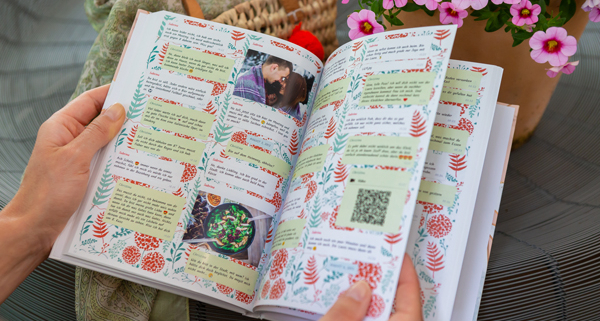 So, you are going to give a really special someone in your life the probably most personal book in the world: you are going to print your WhatsApp chat. And to top it all off: you can make it even more personal by adding a dedication :). Think of it as the grand entrance to your story. What more could we say? Much more enthusiasm than Leanne fells for her very personal WhatsApp book feels, is quite impossible! 🙂 After Leanne had written us, we wanted to know more about her story and asked her a few questions. And what do you think about Valentine’s day? Just like every year, St. Valentine’s Day will take place on the 14th of February. It’s a day that not everyone agrees on. No matter whether happily married or single: some hate the day, others love it. Many couples love to celebrate their relationship in a particularly romantic way – but just as many avoid it at all costs. So what is this day? Romantic? Kitschy? Or simply annoying? /wp-content/uploads/2016/03/zapptales-logo.svg 0 0 Anna Kimmerle-Hürlimann /wp-content/uploads/2016/03/zapptales-logo.svg Anna Kimmerle-Hürlimann2018-01-18 11:15:262018-01-18 11:27:11And what do you think about Valentine’s day? The world’s most personal present in just four simple steps. You have a seriously long chat with your best friend, your boyfriend or your sister? And you want to print your WhatsApp chat as a book? You think one book would never be enough? You’re right! That’s why zapptales divides your very long WhatsApp chats into volumes. Automatically. And turns them into the Chronicles of … You! https://www.zapptales.com/wp-content/uploads/2016/09/WhatsApp-Chat-in-mehreren-Bänden.jpg 1030 1030 Anna Kimmerle-Hürlimann /wp-content/uploads/2016/03/zapptales-logo.svg Anna Kimmerle-Hürlimann2016-09-14 09:20:392016-09-14 09:19:39Your WhatsApp Chronicles are now Automatically Divided into Volumes!